While it’s still a little chilly outside in Cincinnati, at Community Matters, we are excited to know that Spring is just around the corner! Spring symbolizes so many positive moments for us, including plenty of sunshine and more opportunities to connect with our neighbors in Lower Price Hill. One of those opportunities is the kick off of the growing season in the LPH Community Gardens. 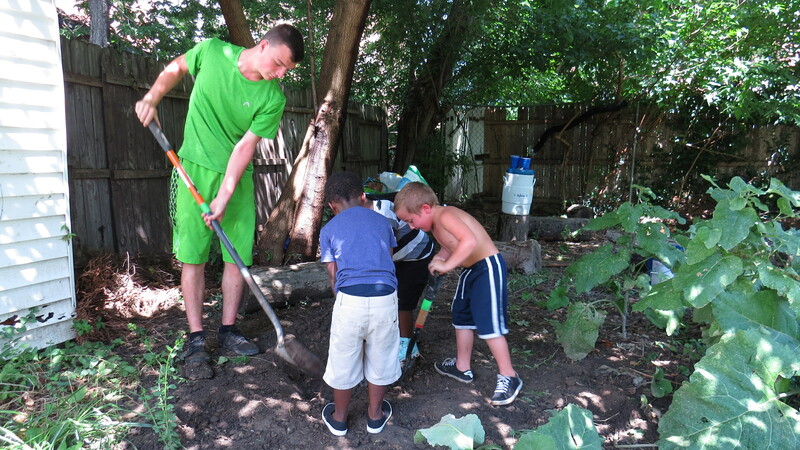 Last year, more than 200 adults, children, and volunteers engaged with our 3 community gardens. In addition to regular growing and harvesting of produce, we hosted weekly Garden Parties, monthly Family Nights in the Garden, piloted Home Gardens in our neighbors’ backyards, and launched a Garden Apprenticeship project that offered leadership opportunities for youth in the community. Speaking of those Apprentices, those 4 talented teens worked a total of 190 hours last growing season engaging the community at weekly Garden Parties, helping with the general upkeep of the gardens, and learning job readiness skills. Here are a few highlights from their time with us. Keaura, who never missed a day of work and was never late, opened her first checking account and said her biggest take-away from the experience was learning how to manage money. Tucker (pictured above) was so inspired by learning the basics of gardening that he started his own Home Garden to feed his family. Allen had the opportunity of working with Joshua Jones, Community Garden Coordinator at Turner Farms, through the apprenticeship project and has since reconnected with Joshua through gardening at his new school, Riverview East. The seeds have already been started, and we are excited to welcome 4 new Garden Apprentices to the LPH Community Gardens this year, launch an after-school Garden Club in partnership with Oyler School, and expand Home Gardens with the help of families in our community. We invite each of you to stop by and visit the Gardens this year!